So I know it's super early to be thinking about this.. but I'm guessing the next few weeks might be a little occupied with things other than "Ben". So we were brainstorming today and trying to come up with a good idea for a Halloween Costume. 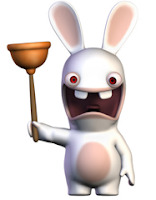 I was totally thinking a Raving Rabbid.. I think we finally, sorta, initially, for now, settled on R2D2! What a great fun costume to make WITH HIM this year. I hope it lasts.. I'm totally geeked about what Pete can do electronically to make him beep and light up.. But what will cloudy be? ?